Heart rate variability (HRV), or the beat-to-beat alterations in heart rate, is an accurate and reliable reflection of the many physiological factors modulating the normal rhythm of the heart. In fact, HRV provides a powerful means of observing the interplay between the sympathetic and parasympathetic autonomic nervous systems (ANS). HRV is also of great value in determining the degree of progress in many clinical diseases (for example, diabetes, hypertension, thyreotoxicosis, leukemia, different types of oncological diseases, etc.). For this reason, HRV has escalated in use as one of the best diagnostic instruments in contemporary medicine. The practical application of the method, in ecological and professional aspects, requires software and hardware facilitation. Dantest products encompass these theoretical and clinical studies with a proven methodology for patient monitoring, tracking and assessment. In the last 30 years, HRV has received increasing attention as a forecast indicator of health risks related to chronic diseases, morbidity rates, mortality, and aging. Today, the medical community largely considers HRV as one of the most reliable indicators of Nonspecific Adaptation Deficit (NAD). The Nonspecific Adaptation Deficit (NAD) concept was created and developed by Prof. Dr. Svetoslav Danev, Doctor of Medical Science alongside a medical team of associated doctors. According to the concept, life-threatening diseases are preceded by certain nonspecific changes. These changes include depletion of the capacity for adaptation to unfavorable changes in the external or internal environment. The increased requirements and the decreased capacity for adaptation create a vicious cycle from which the only exit is lethal disease and death. In terms of physiology, the NAD concept is based on decreased work efficiency of the negative back connectors, which play a major role in the regulatory activities of the centers for coordination and regulation of basic life processes. The Autonomic nervous system is extensive and is involved in the function of every organ system. Clinical manifestations of autonomic dysfunction are involved virtually in all diseases. The structural pathologic process affecting brain whether infectious, degenerative, neoplastic or inherited may result in autonomic syndrome. In recent years, ANS/HRV has successfully been used to assess the negative influence of a wide spectrum of stressors including environmental pollution, dietary problems, psycho-social discomfort, and different behavioral disorders. Dantest monitoring has been developed according to the standards and mathematical procedures for short-term HRV Autonomic nervous system (ANS) analysis as well as for performing and evaluating pulse flow and autonomic challenge tests. Age and systolic pressure strongly correlate with PWV. In fact, the most important factor contributing to increase in PWV is age because of increased arterial stiffness caused by medial calcification and loss of elasticity. The measurement of pulse wave velocity is useful in the study of the effects of aging, vascular diseases, vaso-dilating and vaso-constricting agents on arteries. 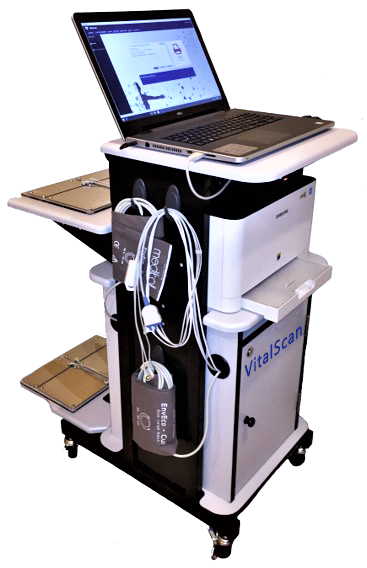 Dantest Pulse Wave Velocity measurement is a convenient method of quantifying arterial stiffness and augmentation. PWV provides invaluable insight into cardiovascular health, management of disease progression and monitoring the effects of medication, treatments, lifestyle and dietary habits.